An elephant was rescued by the Sri Lankan navy after being found swimming in the sea 9 miles from land. The elephant was rescued in a 12 hour operation by the Navy after appearing to be in trouble. The Navy say the jumbo got caught up in strong currents off the of Kookily. Specialist divers managed to secure ropes around the animal, before it was towed by the Navy boat into shallower waters. Elephant are good swimmers and being that far from the coast is not uncommon, according to wildlife experts. But they can’t swim for long periods because of the amount of energy they burn. 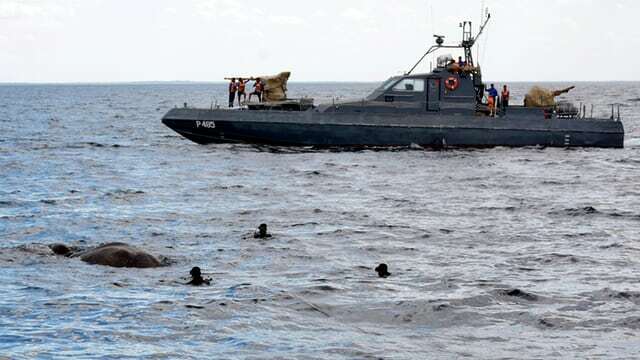 It is thought that this elephant would have drowned without the timely help of the Sri Lankan Navy. Watch video of the dramatic life saving elephant rescue below.